Wahoo: The wahoo can be one of the most exciting fish to catch, often causing anglers to shout woo hoo as the fish takes off on the first blistering run after being hooked. Sometimes you would think you hooked onto the back of a southbound bullet train. The problem starts when the fish stops that run. More often than not, the wahoo will do a 180 and run straight back towards the boat all-the-while shaking its head to throw the hook. It’s at this moment that keeping the line tight becomes imperative. If the line gets slack, the fish can throw the hook and the angler’s expression will turn to boo hoo! Wahoo Fishing Tips: The wahoo is often a pleasant surprise while trolling for dolphin and sailfish. Typically they will fall victim to a lure or a lure/natural bait combination trolled deep or way back in the spread. 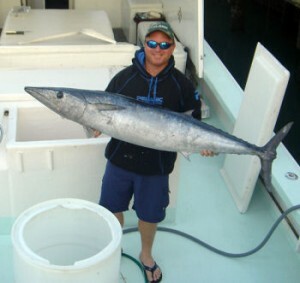 Some of the biggest wahoo every year is caught live baiting for kingfish on the inshore reefs. When it comes time to cook your catch, the wahoo is one of the best of the best. It also rivals tuna when it comes to making sushi, sashimi and ceviche.